In an ongoing series of articles, the Jack Eichel Tracker will monitor Eichel’s performance and development in his freshman season at Boston University. As a BU student, I will have the unique opportunity to watch him in person frequently throughout the year. Posts will be done weekly or bi-weekly, depending upon BU’s schedule. Two days after being named the National and Hockey East Rookie of the Month for October, Jack Eichel prepared for his first taste of the Commonwealth Avenue rivalry. The “B Line” rivalry is one of bitter hatred on both sides, making for some of the most exciting games in all of college hockey. It also meant that Eichel would be going head-to-head with 2015 draft eligible defenseman Noah Hanifin of the Eagles. Many believe Hanifin, Eichel’s teammate with the USNTDP last year, will be the 3rd overall pick next June. Eichel would end up seeing a lot of Hanifin during the game, as BC’s top pairing of Hanifin-McCoshen was out on the ice against Eichel’s line the majority of the night. In recent times, BC had dominated in their own building where the Terriers had not won since 2011. In what would be their 266th career meeting, the Terriers would have to weather a hostile crowd in Conte Forum to come out with the victory. The first period went by with little fanfare, as both teams struggled to create consistent pressure. The players were noticeably amped up and jittery due to the high stakes of the game, and the loudness of the crowd. Both teams registered seven shots with no goals being scored. At the end of the period, Eichel had a breakaway but his shot was turned aside by Thatcher Demko, a second round pick of the Canucks in 2014. BC opened the scoring in what would end up being a see-saw battle early in the second period. A mad scramble in front of the BU net resulted in a 1-0 BC lead as Chris Calnan put in a third-chance shot. The Terriers answered back ten minutes later as Rodrigues took little time getting used to his new linemates. He corralled the puck high in the BC slot, deked around a sprawling BC defender, and roofed a backhand past Demko, who had a lot of traffic in front of him. The teams continued to trade goals, with BC owning a 3-2 lead with less than 10 minutes left in the game. On a faceoff in BC’s zone, Eichel won the puck cleanly back to Brandon Hickey, who went cross-point to his partner Brandon Fortunato. Fortunato gave it right back to Hickey for a one-time blast that deflected off Eichel’s foot and past Demko to tie it 3-3. The goal can be found below. A goal by Evan Rodrigues two minutes later would prove to be the game winning goal for the Terriers, who added an empty netter for a final score of 5-3. Rodrigues ended the game with 2 goals, but could have had a few more if he could have converted two beautiful feeds that Eichel had given him in the second half of the game. Eichel’s goal was his only point of the game, but he was clearly the best player out on the ice. One area that he continued to struggle was faceoffs. No official numbers are tracked, but I would be willing to bet that he is under 50% on the year in the dot. He has also gotten thrown out of more faceoffs than any BU center, no doubt a byproduct of his frustration with his performance in that area. Coming off the high of a thrilling win against your biggest rival in their building, the Terriers could not rest on their laurels as they had to face Hockey East newcomers UConn Saturday night at home. Despite having just two drafted NHL prospects on their roster, UConn was able to defeat BC by a score of 1-0 earlier in the week. Just 35 seconds into the game, Eichel corralled the puck along the boards in the UConn zone as two defenders went bearing down on him. He found Dan O’Regan open with a cross-ice pass, and with a few nice moves, tucked in a backhand past the UConn goalie for an early 1-0 lead. Below, Eichel is at the top of the screen and he makes a pass to the tape of #10 O’Regan right after this screenshot. After two UConn goals, BU entered the third period in a 2-1 deficit. In the first shift of the period, Eichel controlled the puck and walked along the UConn blueline. 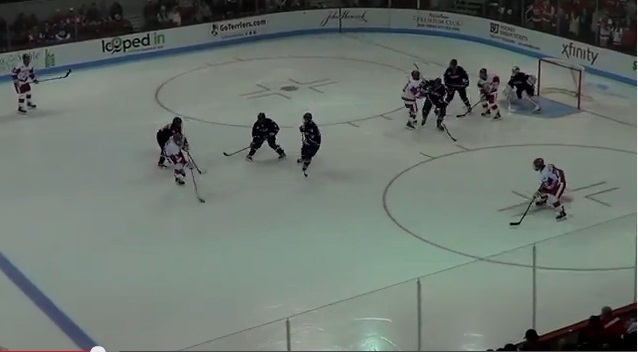 As he walked the blueline, all three UConn forwards moved to cover him. Sensing one of his teammates had to be open, he dished the puck off to defenseman Brien Diffley on the right dot, who rifled a one timer over Rob Nichols’ shoulder to tie the game. Eichel is in the high slot, and he makes the pass to the Terrier on the right dot. Despite UConn sending multiple defenders after him on both assists, he still easily finds his open teammate for the goal. Eichel’s final point of the night came on an outlet pass that sprung Dan O’Regan on a breakaway. O’Regan split the UConn defenders, and Eichel feathered a pass between them. O’Regan made a beautiful move on the breakaway and gave BU the 4-3 lead with less than five minutes to play. UConn was able to tie it up a minute later on the power play, and the game ended in a 4-4 tie. Eichel finished with 3 primary assists on the night. On the weekend, he had 1 goal and 3 assists. He is tied for second in the nation in points, and leads the country in points-per-game. Up Next on the Jack Eichel Tracker: The Terriers will face the Maine Black Bears twice in the next two weekends, and will face the UConn Huskies once in that time span as well.